The King of the New year is Saturn, which conjoins Jupiter in Sagittarius (for a few days in April 2019 and after 4 Nov.2019), which makes this year moderately good for the world, in an overall context, though with a few hiccups. FOR a variety of reasons be it political, social, economic, medical or scientific, Mundane Astrology holds enormous promise. With its scientific outlook, Astrology can guide both the scholar as well as the user in fixing the apt time for successful commencement and completion of works undertaken. It can enable the farmer to make provision in advance for a drought or for a cyclone. This makes Mundane Astrology, a useful tool to decipher Annual trends. With these opening remarks, let me straight away go to the subject of analysing the Astrological prospects for the Vikhari Solar New year, which operates from 14 April 2019 till 14 April 2020. The weekday on which Ugadi falls becomes the King and this year it happens to be on a Saturday (on 6th April 2019) and its day-lord Saturn is anointed the King. Vishu, the day of Solar ingress into Aries falls on Sunday (being the 14th day of April 2019) and its day-lord Sun becomes the Minister. On 22nd June 2019, Sun enters the constellation Arudra in Gemini and its daylord Saturn becomes the lord of clouds (Megadhipathi). The King of the year is Saturn, which conjoins Jupiter in Sagittarius (for a few days in April 2019 and after 4 Nov.2019), which makes this a moderately good year for the world, in an overall context, though with a few hiccups. Participation of Ketu in this conjunction may not bring about a satisfactory state of affairs. There will be civil unrest in many parts of the world. War - like situations and deterioration in ties will mar the political climate in the world. Famine will become widespread. Theft, hijacking and other crimes will become a serious threat to peaceful living. To say that Vikhari is a good year would be a true statement, only in a partial sense. Due to Sun, becoming Minister of the year, there will no doubt be abundance of fruits and vegetables, but issues would crop up in the Public Distribution System. Wastage of fruits and vegetables would occur due to lorry strike and other hiccups in distribution of vegetables and fruits. Political disturbances will also affect marketing of goods, especially perishable commodities. Kerala will get into a series of hartals by varied political groups, leading to disturbances in day-to-day life. Let us first understand the difference between Summer crops and Winter crops. The Kharif Crop (or Summer crop) is sown at the beginning of July coinciding with the advent of Southwest monsoon. The Major Kharif Crops are Paddy, Millets, Cotton, Soyabean, Sugarcane, Turmeric, Groundnut and Red Chillies.The Rabi Crop (or Winter crop) is sown in October and harvested in March. The Rabi Crops in India include Wheat, Barley, Mustard, Sesame and Peas. Lord of Summer crops (Sasyadhipathi) is Mercury. So peace and prosperity will prevail. Vedic scholars will be committed to recitation of Vedas and performance of rituals. Dhanyadhipathi (Lord of Winter crops) being Moon, there will be abundance of grains, Mustard, oilseeds and such similar products. Both Summer crops as well as Winter crops will show bumper harvest. It is interesting to note that while Mercury denotes Summer Crops, Moon denotes Winter Crops for this year. In spite of inconsistent weather patterns and unseasonal rainfall, the agricultural harvest could be expected to be good. Most of the State governments would offer loan waiver proposals to benefit the poor farmers. Lord of clouds is Saturn. There will be unseasonal rains. For once, a cyclonic storm would hit the Southern parts of India (north Tamilnadu and southern parts of Andhra Pradesh,in particular) in the Summer months of April, May and June. In places such as Maharashtra and Kerala, there would be deficient rainfall. All - round peace and happiness are vouchsafed by Jupiter, taking over the mantle of "Lord of Juices" (Rasadhipathi). The reservation policy would be modified to favour the economically backward, amongst the Forward classes. There will be abundance of ghee, oil, honey, milk products and sugar. Sugarcane yiled will increase. The Lord of Metals (Neerasadhipathi) is Mars. There will be an inflationary trend in the prices of Copper. The pharmaceutical sector goes through a year of challenges. Lots of restrictions will come about in manufacturing and licensing. Due to trademark issues, many drugs would become either costly or unavailable to patients in times of dire necessity. There will be shortage of vaccines in summer months. Problems arising out of infectious diseases will get compounded by drug scarcity. There will be an abundance of gems, Corals, Gold,and Red clothes. This is an excellent year for the jewellery sector. The Central government will take a spate of measures to make things easy for the common man under the GST Act. It could make the GST return, a quarterly feature and also provide reduction in rates for several items, to help the middle class and the small traders. Northern parts of India will experience drought - like conditions, whereas there will be copious rains in the South, especially in Tamilnadu and Andhra Pradesh. There will be communal disturbances in Madhya Pradesh and Uttar Pradesh. Due to scarcity, there will be an inflationary trend in dry fruits, seasonal fruits and vegetables. Abnormal rise in the prices of onions and tomatoes is foreseen. The 5th house in general rules over Stock markets. The lord of 5 in its own house in conjunction with the 7th lord Saturn forms a first-rate Parasari Raja Yoga. General condition of state, prosperity, Public health, mood of the masses and the confidence of the people on their ruler are all indicated by the First house. A unique feature of the Solar New Year 2019 is the perfect trine between the Ascendant (Leo), Ascendant lord Sun and Jupiter in Sagittarius. This is an excellent formation, which augurs well for the country. The sign Pisces rises in the Republic Day Chart. Adopting the Theory of Inclusive Methodology of Dr.Ravi Rao, by superimposing the Solar New Year chart on the Republic day Chart , we find that the lord of 10 is quite well placed in the 10th. The lord of 4 (which denotes 10th from the 7th) is debilitated and also weak in navamsa. The anti - incumbency factor will not be sufficiently strong to displace the party in power at the Centre. The road to formation of big alliance of Opposition parties will also be besieged by obstacles and bottlenecks. As the lord of 10 (Venus) is aspected by the lord of 7 (Saturn), a coalition government would get formed at the Centre as an outcome of the Lok Sabha elections, either through a pre- poll or through a post - poll alliance. The stability of the new government is vouchsafed by the presence of Yogakaraka Mars in the 10th and its aspect on the 7th lord Saturn. Mood of anti-incumbency would prevail in Haryana and Jharkhand. The 2nd house governs the national wealth, the exchequer, trade, money matters and Revenue. Due to political compulsions, the government would choose to forego revenue and there would be increase in freebies and subsidies. The basic exemption limit in Income tax would undergo a steep increase. The Union Budget 2019 would be a liberal one and would receive the wholehearted support of business leaders and the common man. No new taxes or levies would be imposed. The fiscal deficit would go up as a result of these measures. The 3rd house denotes transport including railways, airlines, mobile phones, satellites, books and newspapers. The sextile aspect of 3rd lord Venus on Ascendant lord Sun would indicate that there would be tremendous improvement in the efficiency of Railways. New coaches and engines would be introduced which are on par with international standards. Radiation - free mobile sets are likely to hit the markets. The fact that the 3rd lord Moon is in own house in conjunction with the Yogakaraka Saturn in India's Independence chart coupled with the fact that the Sub - period of Saturn is now in operation in the Mahadasha of the Moon reiterates the fact that media, telecom, transport and communication areas would undergo a major transformation in the years to come. The sextile aspect between Mercury and Mars show that the volume of transaction in Real-estate is likely to shoot up. The 5th house governs theatres, music halls, educational institutions, speculation, betting, lotteries and amusement parks. These sectors are greatly favoured by the 5th lord Jupiter occupying its own house. However a word of caution; security needs to be beefed up in malls and cinema theatres, as the 5th house has Ketu in it, aspected by Mars. Infectious diseases and mortality rates would go up, due to the conjunction of 6th lord Saturn with the malefic Ketu, aspected by Mars. Polio vaccine needs to be strictly administered. Diseases of gastro - intestinal tract would surface due to the 3 - planet conjunction in Saggittarius. There is a steep increase in the incidence of Diabetes this year. Abortion rates in India tend to go up. Foreign affairs, Foreign trade, Foreign direct investment, diplomatic ties with the western world are all favoured by the presence of Venus in the 7th, aspected by the 7th lord Saturn. In general, accidents and national calamities would tend to be less this year, through the strong placement of 8th lord Jupiter and the presence of Mercury in the 8th. Whenever the 8th house is influenced by a benefic, there is a mood of pro - incumbency in the country. Indian Mathematicians would gain recognition, at the international level. Law, justice, courts and Higher institutions of learning are all governed by the 9th house. The Supreme Court will assert its supremacy through a series of stunning judgements, which reiterate the fact that nobody is above the law. Judicial activism reaches dizzy heights. Indian judges gain recognition at the International level for their non - partisan outlook and zeal to uphold the rule of the law. Reputation, political situation, Upper Classes are all denated by the 10th house. As mentioned earlier, India is headed for the right political climate and right leadership, due to the presence of Mars in the 10th. The sextile aspect between Moon and Mars indicates that women will have a major role in administration. The finances of the Exchequer would take a beating with the lord of 11, Mercury, getting debilitated in the 8th. 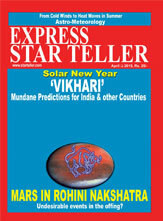 The Solar New year Vikhari will prove to be an excellent year for the USA. At the beginning of New Year 2019, the stock markets were be in the doldrums. But, a Bullish run will start in the US markets, yielding bumper returns to investors. As Rahu occupies the 5th, there is need for water - tight security in schools, colleges and places of Higher learning. Cruise operators need to exercise caution, as lord of 8th, Mercury, is debilitated in the 2nd. Natural Calamities would affect USA in the form of typhoons, tornadoes and hurricanes. The GDP rates will show an impressive growth. Some kind of liberalisation can be seen in Trump's immigration policy. Indians in USA can heave a sigh of relief, as restrictions on Visas get removed. As regards Middle East, Trump will exercise a policy of belligerence. USA will do well to win the Noble Prize in Chemistry. Chances of India winning the ICC Cricket World Cup 2019 appear bright, as lord of 5, Jupiter, aspects the 11th house from Sagittarius. Further India will do well in Sports especially Chess, Badminton, Table Tennis and billiards. Both the Indian Men's team as well as Women's team will come out with flying colours in International contests in Hockey. Iran will get exposed to both manmade as well as natural calamities. A major natural disaster would hit the regions in and around Iran and Iraq. Mood of belligerence will prevail in Teheran towards its opponents. Pakistan is headed for troubled times. The ruling dispensation in Islamabad will need to burn their midnight oil to hold on to power. This will be a testing phase for Imran Khan. UK enters into the bhukti of Mercury in the main period of Rahu. 2019 will be a better year in an economic sense. United Kingdom will overcome its post - Brexit blues and enter into a phase of economic and political consolidation. The Solar eclipse of July 2 will adversely affect the ABC nations namely Argentina, Brazil and Chile. The Partial Lunar eclipse of July 16 will adversely affect the European countries. Annual Solar eclipse of December 26 will affect the political climate in Saudi Arabia. It will also trigger tidal waves and hurricanes in Philippines. When Jupiter resumes Direct motion in Scorpio on 1 August 2019, there could be a breakout of an epidemic. The common man will be put to hardship, due to imposition of additional taxes by the Central government. Thus a few problems are foreseen in August 2019. Saturn turns retrograde on 30 April 2019 and assumes Direct motion on 18 September 2019. Around this time, famine like conditions could prevail in India.. Areas adjacent to Ujjain and south east part of Madhya Pradesh would get affected by Saturn's transit of Uttarashada star. According to Varahamihira, price of Gold is based on the position of planets with references to two signs which rule over Gold i.e. Aries and Capricorn (Brihat Samhita, Chapter 41, Translated by N.C.Iyer). There are four important rules, which have a bearing on Gold Prices. 1) Transit of malefics over Upachaya rasis (3,6,10 or 11)from Aries and Capricorn will produce an abundance of the commodity, i.e. there will be copious supply.We can infer that Gold prices will come down, as Supply and Price would have an inverse relationship. 2) Jupiter in a Trikona, Kendra, 2, 11 from Aries or Capricorn will produce abundance of the commodity, meaning there will be copious supply. We can infer that Gold prices will come down, as Supply and Price would have an inverse relationship. Same is the case, if Mercury is in 2, 5, 8, 10 or 11. 3) Venus in 6 or 7 will produce a Bearish trend in Gold prices. 4)Sun and the sign Leo have a close relationship with Gold. a) When Sun transits a friendly sign, aspected by a malefic,there will be a spurt in Gold prices. b) When Sun transits an inimical sign, aspected by a malefic, there will be a fall in Gold prices. Same is the case, when Sun transits a friendly sign and receives benefic aspect. c) When the sign Leo is aspected by benefics, there will be rise in Gold prices; Gold prices will fall, if the sign Leo comes under malefic influences. 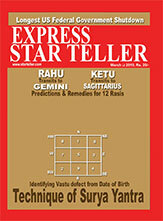 Needless to say, it is not an easy job for any Astrologer to predict with precision, movement of Gold prices. However, with experience and with an intelligent application of the above-mentioned rules, one can say with a fair amount of certainty, the Gold trends. The accelerated motion of Jupiter into Sagittarius in the fag end of March 2019 lasting till the third week of April 2019 would result in a spurt in Gold prices, as Jupiter would be aspecting the sign Leo. However, this Bullishness would be shortlived, as Jupiter moves back into Scorpio and also Mars from Taurus aspects Leo. I also foresee a Bullish run in gold from mid-March 2020, when Jupiter from Sagittarius would aspect Leo, while Sun in Pisces (a friendly sign) is aspected by Saturn from Capricorn. For a major part of 2019, there would be a subdued trend in Gold prices. Crude oil is denoted by the Zodiacal sign Pisces. Though the presence of Saturn in Sagittarius in the 10th, in a quadrant, is supportive of petroleum prices, Jupiter in the 9th will lead to surplus production of petroleum, resulting in a situation where Supply exceeds Demand, contributing to a fall in prices. Consequently Crude oil prices tend to get stabilized to about 60 dollars per barrel. The introduction of hydrogen as a source of fuel for automobiles and as a source of power for batteries would further lead to fall in petroleum prices in future. A breakthrough in hydrogen as a source of energy is on the cards. Gold as a commodity merely has snob value, whereas Petrol is an item of necessity. The astrological principles to view Gold and crude oil prices cannot be applied in a similar fashion, as that would give rise to inaccurate results. On 22 March 2020, there would be a rapt conjunction between Mars and Saturn in Capricorn. This is a very critical period and needs to be negotiated carefully. For the world at large, this is a testing time. Astrology is a probabilistic science, i.e. it does not rule out the results flowing out of exercise of freewill. What this means is that the astrological forecasts made, which indicate negativity can be overcome through properly executed actions.